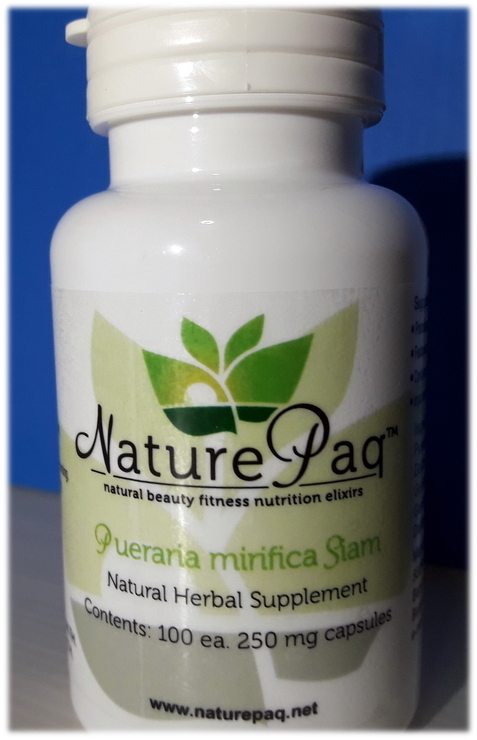 Why Siam Natural & NaturePaq brands? Potency, authenticity and full documentation is what its all about in a world of fake & bogus health supplements being marketed on the internet. Most all of what you'll see on the internet is unlicensed, undocumented "wild crafted" low grade Kwao Krua. Try to find a comparison to our (HPLC) Certificate of Analysis specifications (below) from a real company with a company name, address, phone number. You most likely won't be able to find one. What Amazon, eBay & Etsy and other internet sellers commonly sell is definitely the lower grade "wild crafted" herb at best and more than likely an incorrect species entirely in many cases. Beware! Several companies are currently under investigation by the Thai Inspector General, Ministry of Public Health. There are 13 species in the Pueraria mirifica family and only one contains the unique phytochemicals, Miroestrol & deoxymiroestrol. 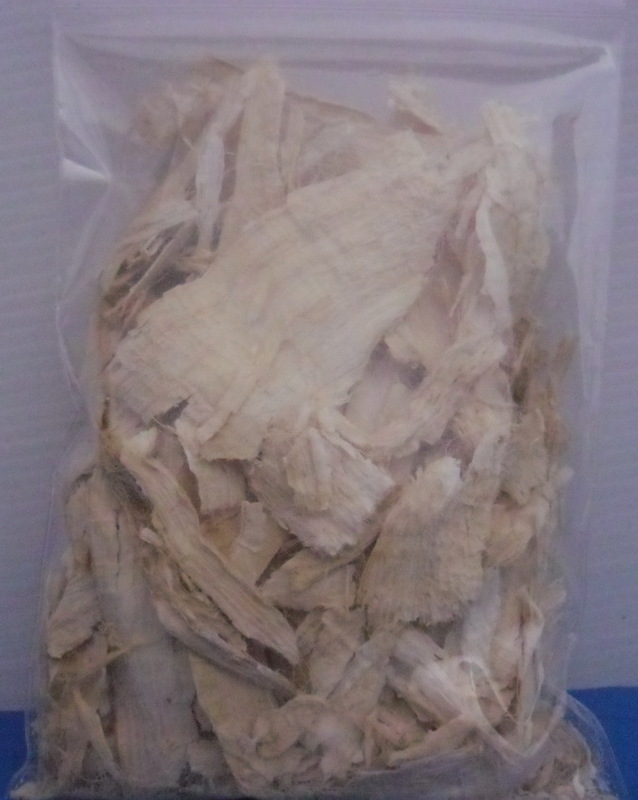 Also, some sellers are packaging Chinese "Kudzu" species and selling as Pueraria mirifica and its not the same botanical species as Thai Pueraria mirifica whatsoever. We are fully licensed by Thailand Minisrry of Public Health & US FDA and have our NaturePaq brand in America on www.naturepaq.net. 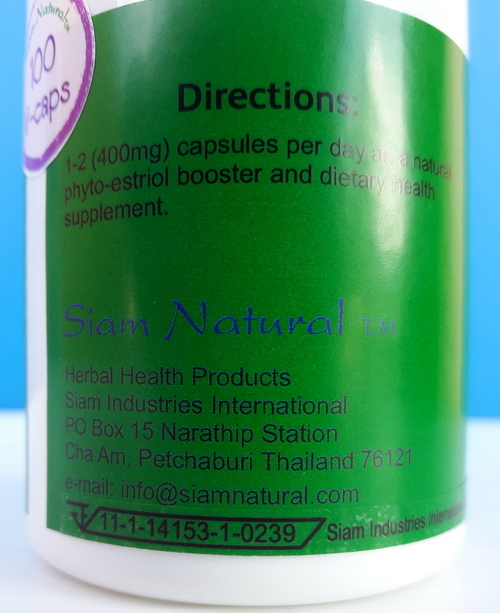 It is exactly the same as the Siam Natural brand with different text on the label to meet US FDA labeling guidelines. 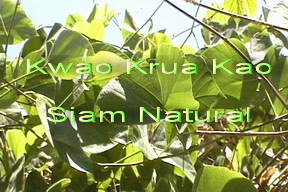 Read our Siam Natural wordpress blog for more details on bogus Thai Kwao Krua. "Whats real & Whats fake"
Siam Natural brand of Pueraria mirifica is a certified licensed export by the Thailand Ministry of Health, FDA as an organically cultivated herbal health supplement that's produced in climate controlled green-houses in north Thailand and embraced by doctors, clinics, facialists and medical practitioners worldwide for numerous benefits such as maintaining a yourthful appearance, face & breast skin firming-conditioning, fine-line wrinkle reduction, female hormone-receptor balancing and hair color-texture restoration. Don't be fooled by the multitude of internet sales pitches offering so called "authentic" Thai Kwao Krua Kwao Pueraria mirifica products. It's all about the potency of the Pueraria mirifica root tuber. What you see and read on eBay, Amazon & from foreign based US, UK & AU entrepreneurs web sites with a slew of Pueraria mirifica products and brands at low prices are not going to produce the natural beauty, skin firming or breast enlargement results you're seeking. Before you purchase the incorrect species, a weak strain, or low grade so called "pure" extract, read the facts - especially if you're seeking natural breast enlargement. Our philosophy is to remain true to the ancient Thai tradition of sun-drying our herbs and then grinding into powders. We believe that chemical processing, while reducing bulk, also inadvertantly removes vital synergistic constituents. There's a resurgence back to natural fruits, herbs & teas that can improve your looks, energy, and vitality. 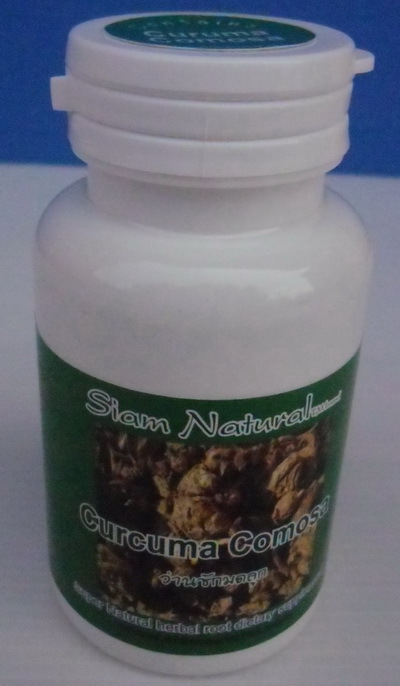 Organically cultivated Super Natural Pueraria mirifica in 250 mg Veggie caps. Natural green living products are healthier! Our latest organically cultivated chemical free Pueraria mirifica contains a whopping 357.516 mg of the active ingredient, Puerarin. (exceding our previos strain of 193 mg per 100 grams) One capsule a day is recommended as an ideal supplement for menopausal relief & sustained hormone restoration and body and skin care balancing! 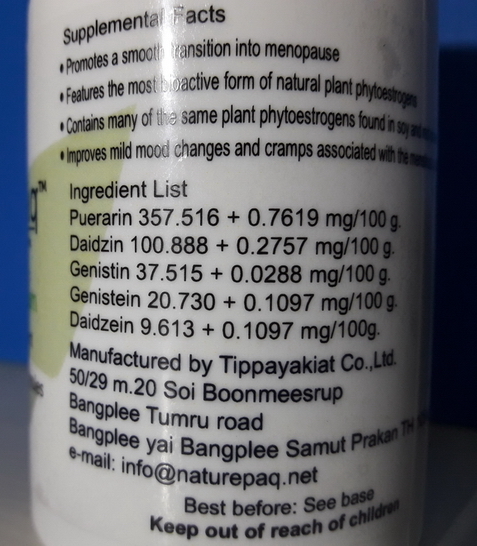 Siam Natural organically cultivated Pueraria mirifica is super potent at 357.516 mg per 100 grams Puerarin! 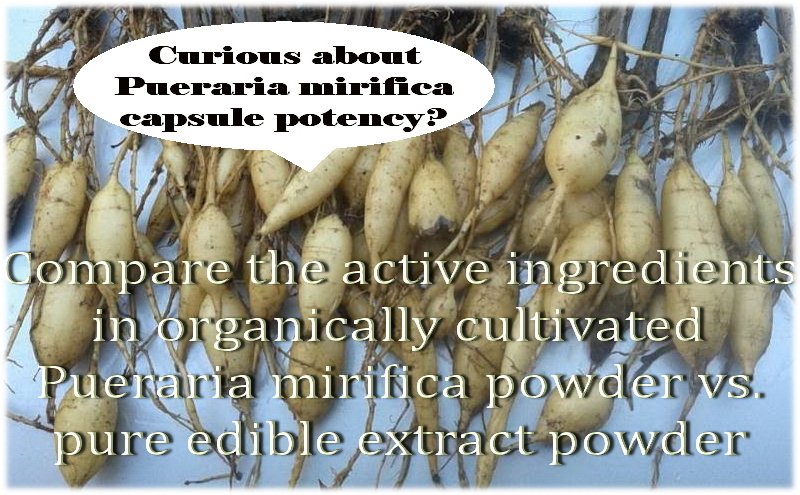 Introducing pure organically cultivated Pueraria mirifica root powder in 250 mg Veggie-caps. This 100% natural herbal compound is ideally cultivated in a 'green house' environment with organic fertilizers and timed misting sprayers. 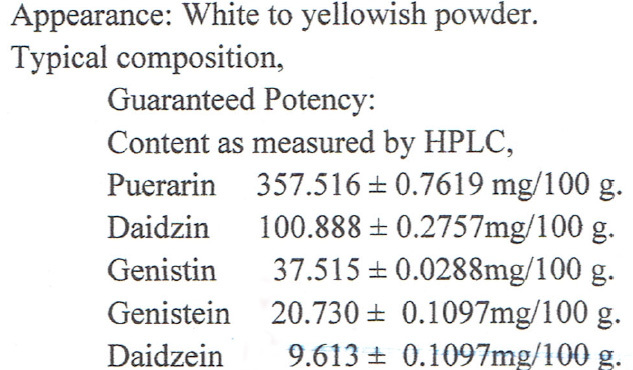 The new strain is significantly more potent than the previous strain that was 193 mg per 100 grams of Puerarin. Organically cultivated Pueraria mirifica V-caps now contain 357.516 mg of Puerarin per 100 grams compared to 90 mg per 100 grams of pure edible grade extract. The scientific proof of the percentage of active ingredients and efficacy of Siam Natural Pueraria mirifica organically cultivated raw powder is displayed in the HPLC chromatogram image below. It's nearly four times as potent as pure edible grade extract and contains all of the natural phyto-chemicals available in the root tuber like Miroestrol and deoxymiroestrol which are believed to be the key ingredients for optimum results for skin toning, firming, restoration & breast enlargement. 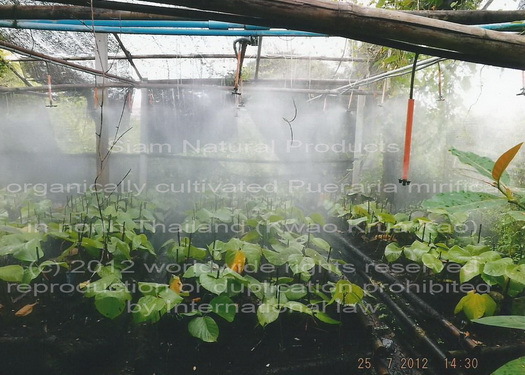 Nearly all of the commercial Pueraria mirifica products now available are extracted from the raw root tubers from north Thailand. 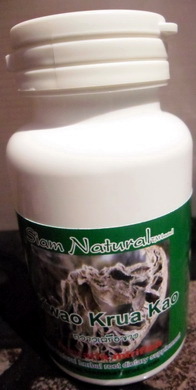 Siam Natural Products has been selling the pure raw sun-dried powder on the internet since 2003. In 2011 we made our first encapsulations in 400mg V-caps with a combination of 300mg of the premium grade raw root powder with 100 mg of powdered extract which has been widely received by the international community. We now have 100% green-house organically cultivated Pueraria mirifica root powder available in bulk and in 250 mg Veggie-caps. This came about through a lengthy controlled R&D process. 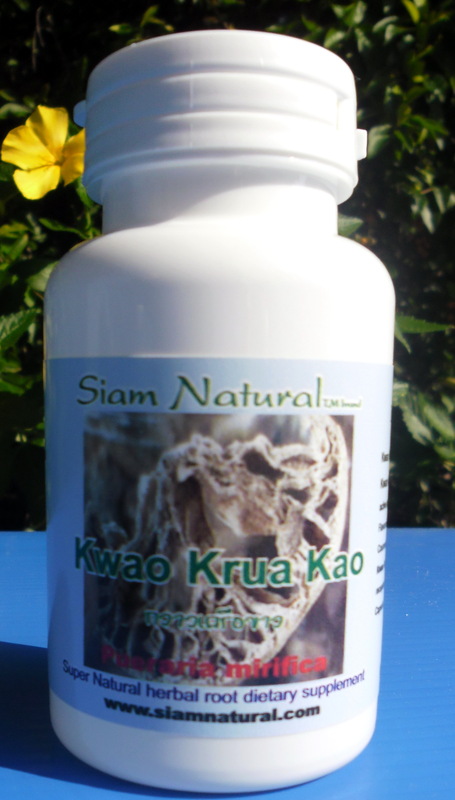 Over the past 25 years Thai scientists, botanists, and academics have been doing extensive research and development with the Kwao Krua Kao native herbal botanical. This resulted most recently with the first organically cultivated super natural specimens of Pueraria mirifica. Our growers found they could simulate the rainforest conditions and add organic fertilizers and timed water sprayers to produce a new superior grade of Pueraria mirifica, even more potent and 100% natural compared to the solvent based extracts that are now widely marketed by multinational companies worldwide. 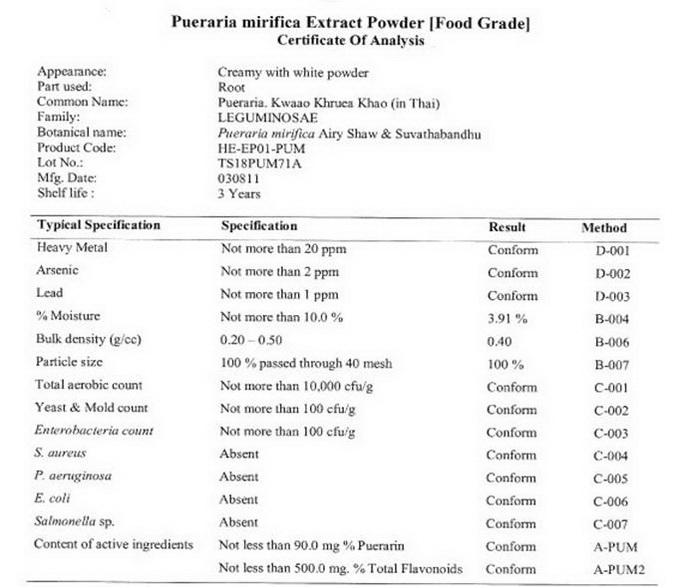 Some manufacturers may claim to offer 'pure Pueraria mirifica extract' which means it's 90 mg per 100 grams (COA below) of Puerarin food grade extract compared to the organically cultivated root powder at 357.516 mg per 100 grams (HPLC above). 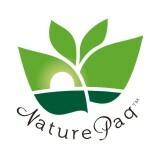 US mainland customers can now purchase direct in America on www.NaturePaq.net for quick-ship delivery via USPS 5 day service! 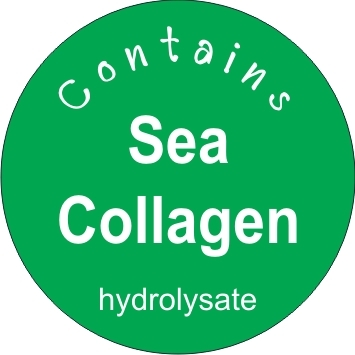 Pueraria mirifica with Sea Collagen is excellent for hair, skin, nails, skin tissue & joints. Fish Collagen containis high protein content & amino acids. helps prevent early facial wrinkles and premature graying of hair when used daily as a dietary supplement. Important Pueraria mirifica benefits. Pueraria mirifica may constitute a new class of safe, non-toxic, effective, hormonal therapeutic support as natural, Selective Estrogen Receptor Modulators (SERMs), with estrogen agonist activity in certain tissues and antagonist activity in others, which help balance hormonal function, and possess significant, anti-aging, protective properties for estrogen sensitive tissues in both men and women. It should be noted that although Miroestrol and Deoxymiroestrol are suggested by the scientific community to the active phyto-chemicals, the industry standard measurement are from other molecular components such as Puerarin, Daidzin, Genistin, & Genistein The latest scientific research published in 2007 by the Health Sciences Institute stated, “Pueraria Mirifica doesn’t simply mimic estrogen in the body the way that other therapies do, whether bio-identical or not. Instead, the herb (much like the human byproduct it resembles) acts on estrogen receptors. In more clear terms, it acts as a balancing agent: When levels of estrogen are too high. Pueraria Mirifica will tie up receptors to weaken the hormone’s effects – when levels are low, the herb exerts the necessary estrogenic activity without actually increasing the amount of estrogen in your body. 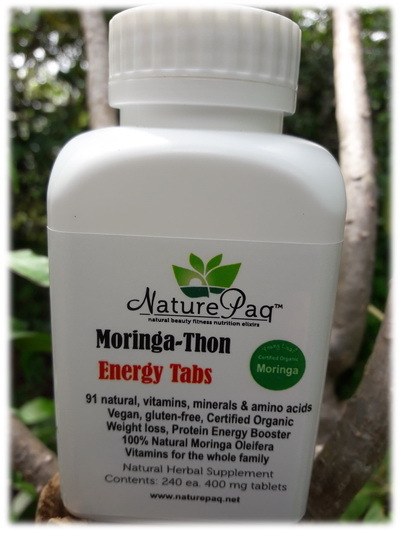 MoringaThon organic tablets enhance the effects of Pueraria mirifica products w Pure high protein & calcium multi-vitamins, minerals, amino acids. 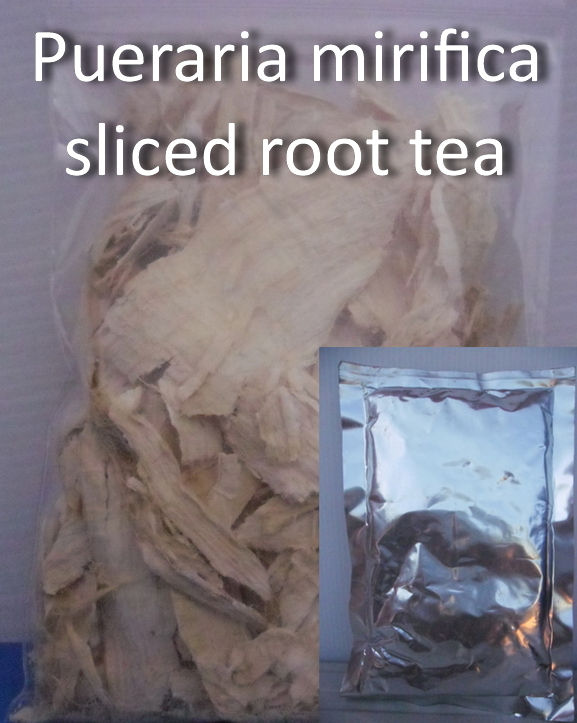 SALE 2 oz for the price of 1 oz of Kwao Krua Kao super natural High Grade organic Pueraria mirifica) fresh sun-dried raw root slices - 100% natural organic tea supplement. Note: Please include cell phone texting number with your Paypal order(s) in case we can't reach you by email. These statements have not been evaluated by the US FDA. These products are not intended to diagnose, treat, cure, or prevent any disease.